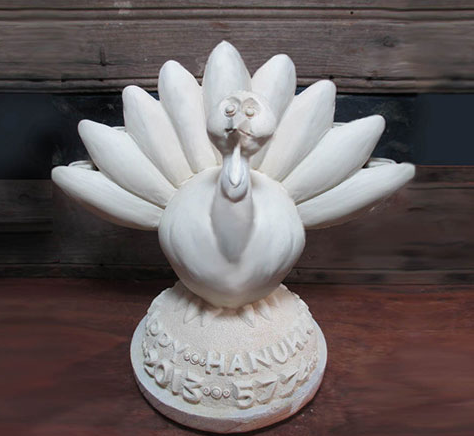 It’s not going to happen again ever in our lifetimes (or likely for thousands of years, for that matter) so the forward-thinking woman who trademarked the term “Thanksgivukkah” a year ago had better milk it for all it’s worth. And also yes, we know you’re sad you didn’t think to trademark it ourselves, considering that everyone seems to be talking about Hanukkah coinciding with turkey day this year. Hanukkah officially kicks off Wednesday at sundown, which means plenty of Americans will have menorahs on their Thanksgiving tables come Thursday. And if Wikipedia is to be believed (which is up to you decide on a case-by-case basis) this convergence between the Jewish and Gregorian calendars probably won’t happen again until the year 79811. So there’s that. The enterprising woman who took advantage of this holiday mashup lives in Boston, reports CBS Boston, and had the term trademarked more than a year ago. “We’re the closest Jewish community to Plymouth Rock and where thanksgiving happened, so it’s awesome to see so many people in the New England community embracing this opportunity,” she said. She’s taking advantage of it by producing a line of merchandise to celebrate Thanksgivukkah, which means only she can benefit from the trademarked name. Sure, you could try alternate spellings like Chanugiving or go the route Manischewitz did and drop a “k” in order to promote stuff for Thanksgivukah, but all the cool kids have latched on to the trademarked spelling.